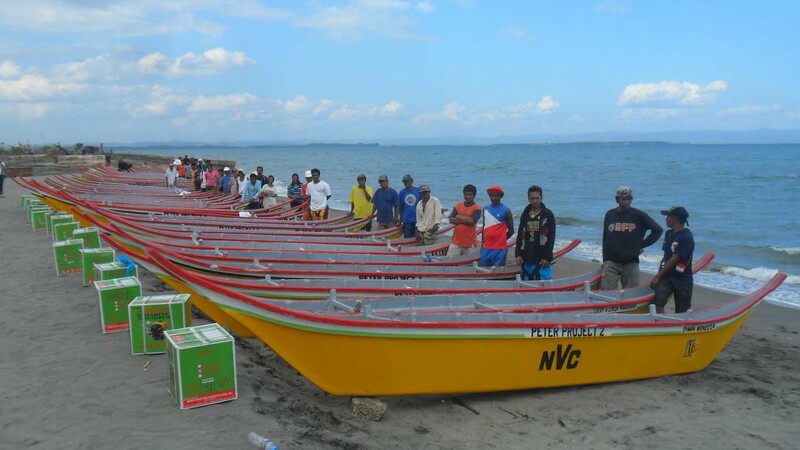 TACLOBAN CITY- About 50 fishing boats made of fiber glass under the program Peter Project 2 of the Negrense Volunteers for Change a non-profit organization from Negros province were turned over to fishermen residents of Barangays 88, 89 and 90 of this city. Mellie Kilayko, president of NVC, explained that their project is only intended for residents of Negros who wanted to become fishermen but after the devastation of typhoon Yolanda in the Visayas region which badly hit the fishing sector, they extended the project to Yolanda affected provinces in the three regions in the Visayas like in Tacloban City. A total of 1,600 fiberglass fishing boats is planned by the group to be distributed to affected fishermen in the identified areas in Yolanda-hit areas in the Visayas. Here in Eastern Visayas, fishermen from Tacloban and Ormoc cities and the towns of Dulag and Javier in Leyte and some parts of Samar are to be given their boats, Kilayko said. He said that they would return next month to give fishing boats to those who were not able to receive during their visit here last week. Kilayko also explained that using fiberglass as material for making fishing boat would help save the environment as trees would not be cut to build one fishing boat. Boats made of fiber glass are more efficient than wooden boats when it comes to maintenance and fuel use, he added. Tacloban City Vice Mayor Jerry Yaokasin said that it is better to give the survivors fishing boats than give them food to eat. The fishing boat gives new hope to every fisherman and will not only provide food for their respective families but also for the entire community, added Yaokasin.